Grrrl Independent Ladies will have their make up date for the Nina Coyote ETA Chico Tornado in Tijuana on November the 4th, 2016 at Moustache bar. For this show the supporting bands will be Blood Ponies, Le Ra and Silent (who are a personal favorite!). The music selectors for the night will be ourselves (I Think I Better Follow You Around) just like we were for the previous Nina Coyote date at Blonde bar in San Diego. 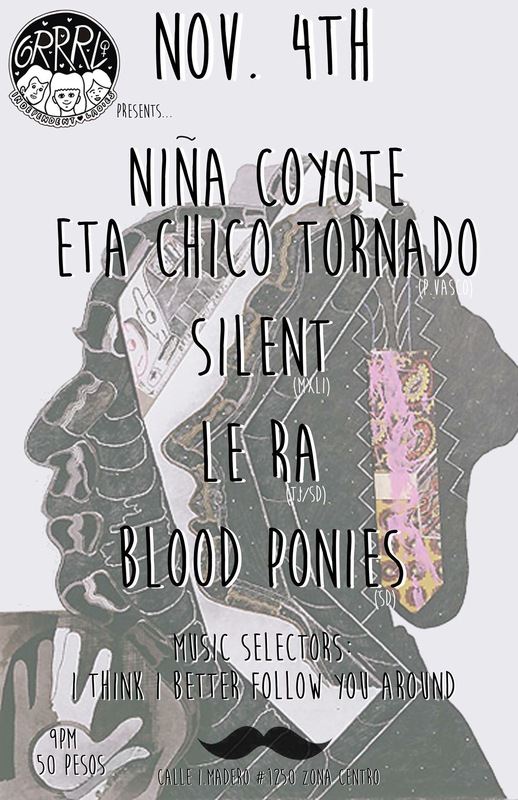 If you like or are even inclined to great, loud and in your face rock n roll the you should give yourself the opportunity to go and witness just how amazing Nina Coyote ETA Chico Tornado are. They are from the Basque Country and they’re here to play loud and fast in your face a la the stooges. As far as Silent goes, well, they might just be that band that you were looking for to fill in the void for that post punk/punk that your heart was missing. I don’t want to set the standards too high but in all honesty if you’re a fan of Nick Cave, Morrissey, Joy Division, now imagen that and then they meet Three One G and that’s more or less what you can expect. Le Ra is Monica Mendoza band who is also the Grrrl Independent Lady who is also the sometimes a touring member of Tijuana NO who is also a documentarian of the Tijuana Independent ladies scene who is also an ok friend to some and an avid chilaquiles eater, she’s also the promoter of this showcase and as such invited the Blood Ponies from San Diego to open this show. Please go and listen to the songs we will be selecting and stay for the bands because they will probably blow your mind if the speakers don’t blow out first. This event is only $50 pesos or $2 dlls. Please go and support your local grrrl gang and some of these bands who are amazing musicians.